How do barriers prevent adhesions? 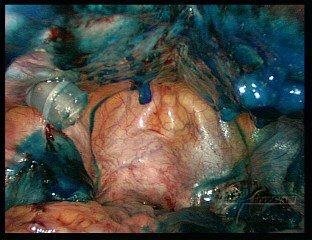 Adhesions are formed after all surgical measures involving laparotomy. But even during laparoscopy, which is a form of minimally invasive surgery, wound surfaces can be formed during certain procedures, such as for example endometriosis or myoma operations. These surfaces can adhere to each other, thus forming adhesions. These adhesions can later cause problems such as pain, adhesion of the uterine tubes (infertility) or of other organs (intestines / ovaries / uterus). They thus have the potential to cause chronic problems and pain requiring tedious treatment measures, and possibly even adhesiolysis, a follow-up surgical procedure to remove these adhesions. Many of the available mechanical barriers in use today are derived from either industrial materials or animal sources. SprayShield™ (formerly SprayGel™) is a new barrier substance from Covidien to prevent postsurgical adhesions. SprayShield™, a largely water based tissue friendly material, fills the need for an effective, safe, easy-to-use system for successful postoperative adhesion prevention. SprayShield™ is a smooth, water based, coating material also known as a hydrogel. This material is formed from two water based polyethylene glycol (PEG) solutions that mix at the site of the injury. The solutions are sprayed using an applicator that is designed for minimally invasive surgical instrumentation. SprayShield™ is for Laparascopic Surgery. SprayShield™ is prepared and applied to the surgical site through the SprayShield Laparaoscopic Sprayer through a 5mm trocar. The SprayShield Laparoscopic Sprayer, a single-use, disposable, has a unique venting capability for safety and a flexible tip for greater control. The SprayShield Laparascopic Sprayer is attached to the SprayShield Air Pump, which is a reusable, self-contained air pump. During an operation a surgeon sprays SprayShield™ onto the internal surfaces most at risk for adhesions. This coats and protects the tissues likely to form adhesions. After the internal wounds are healed, the coating breaks apart and is naturally cleared from the body in the urine. The material is very inert and highly compatible in the body. Since no human or animal based products are used in SprayShield™, the potential risk to the patient is reduced.